The name John Garcia is as synonymous with the stoner rock genre as bears defecating in woods are to phrases about things being obvious. For over two decades the man has established himself as the defining voice of laid back desert rock cool with projects such as Slo Burn, Hermano, Unida, guest spots with Karma To Burn and fronting a band you might have heard of who go by the name of Kyuss. Despite having spent the last few years bringing the Kyuss name back to public consciousness, first by performing live with several members of the original line up as Kyuss Lives! and then putting out new music under the moniker Vista Chino (a Josh Homme induced legal requirement) there have long been rumours that a solo album was being plotted. With a break in the Vista Chino schedule, Garcia has taken the opportunity to unleash the project through Napalm Records to help cement his legacy. Primarily recorded at Thunder Underground studios in Palm Springs, California by Vista Chino producers Harper Hug and Trevor Whatever, the album features a number of guest musicians to help round out Garica‘s vision including Danko Jones, Tom Brayton, Mark Diamond and also another former Kyuss member in Nick Oliveri. In addition to this role call of famous friends the closing track Her Bullets Energy features a guest spot on guitar from none other than legendary fret abuser Robby Krieger of The Doors and was the first thing recorded at his new Horse Latitudes studio. 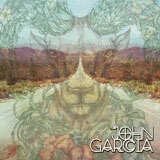 To say that John Garcia‘s solo album comes with the weight of some expectation is no understatement. Having touring the sound that made him famous for the last few years and having been such a part of the magic that band created in the early nineties, it would be no surprise if the eponymous solo album was more of the same. Pleasantly though Garcia looks to carve his own path in the Desert landscape. Harder edged than Vista Chino’s Peace the album, it practically buzzes with energy from the opening track My Mind which is built around a muscular riff and swirling psychedelic flavours that takes a simple refrain and leans on it until it is embedded into your skull and then there is THAT voice. Over the choppy guitar work Garcia‘s voice snarls and soars over the simplest of vocal hooks and it is mesmerising, commanding and most importantly incredibly memorable. The majority of these tracks were compiled over the years and brought to life with the help of Hermano guitarist and cohort Dave Angstrom and it is clear from the strength of the songs on this album that the chemistry existing between them is perfect to compliment the singer and give him a platform to do what he does best; from the marching, skipping upbeat tempo of Rolling Stoned over laid with a sinister sneer or the huge stomping, stadium anthem in waiting that is the stand out track from the album 5000 Miles, this debut solo release features some of his best vocal work in years and is a complete joy to get lost in. The music and it’s collection of talented performers never threaten to up stage the Vista Chino frontman but manages to thrown up some understated and varied gems like the creeping blues of The Blvd which underpins the effect laden vocals with a subtle laid back lounge take on desert rock or the grinding and sliding downbeat open chords of Confusion which allows Garcia to deliver almost spoken word poetry in his rich tones. Elsewhere there are delicious flavourings of his other projects as Argleben, All These Walls and Saddleback recalls the fuzz heavy rush of Slo Burn with great big hypnotic choruses, whilst the likes of Flower with its driving riffs nods to the heady days of Kyuss. Then there is His Bullets Energy and it’s counterpart Her Bullets Energy ; the first featuring a urgent but subtle, catchy riff and some mellow, but dexterous base work, a typical Garcia track, full of clever lyrics and an impassioned performance. The second is a tender piece of solemn emotion that fears a lush guitar tone with a meandering lead courtesy of Mr Krieger and an introspective delivery from John Garcia himself which caps the album off like watching a beautiful sunset with a beer and a fat reefer. Given the amount of musical gold the man has participated in, it was highly unlikely that distilling material compiled over several years for release on his first solo album would result in John Garcia being a turkey but to be honest I was pleasantly surprised and I suppose it is time to admit I was a little underwhelmed with Vista Chinos Peace. This collection of tracks is everything I could want from the man though and is the perfect mix of stoner cool and driving desert rock that I have returned to again and again.